I wrote a lengthy essay as part of a discussion on a Caltech alumni mailing list, and thought some of you might find it interesting, so I’ve cleaned it up a bit and am posting it. It’s a bit longer and more theoretical than most of my posts, but I hope you enjoy it. That is certainly true. The act of making is so complex that without that feedback loop, you make things poorly. But, while being observant will get you there, a good understanding of underlying structure will get you there faster. For example, color theory is universal. I think of it as the “laws of physics” regarding how the eye behaves. For example, if you put a single dot of bright yellow on an overall dark background, your eye will go first to the yellow dot regardless of what the background design is or what medium is used. Why? Because the eye is drawn to contrast, and the light-colored dot is the spot of greatest contrast. Further, yellow is a very assertive color – it draws the eye very strongly. If you put a light purple dot on the background, your eye would still be drawn to the dot, but not as strongly because purple is a receding color – far less assertive than yellow. Those principles are universal. The implementation of color theory, though, varies a lot by medium. For example, weaving is all about optical mixing, because (except in certain specialized situations) you have warp crossing weft, and both show on the surfaces. You can arrange the proportions so you have 90% warp on one side, so it looks like almost a solid color, but you still have 10% dots of another color on that side. So if you are weaving lemon yellow and black, the dots of black will cant your yellow towards green (because yellow mixed with black produces olive green). Learning color theory is separate from putting it into practice. When actually making art, you need to pay close attention to the feedback loop, to check that (empirically) your piece is working. You also need to understand the foibles of your medium. But a generic understanding of how color works, whether consciously learned or developed through working experience, is what teaches you how to design well and fix problems with your color scheme. And while you can develop an intuitive understanding through experience, studying the underlying principles of color is a lot faster. I have been having an interesting time reading through books on drawing. They seem to fall into two categories: the empirical “draw what you see” (the most famous example being the book Drawing on the Right Side of the Brain by Betty Edwards), and the more theory-based “now this is how perspective works, this is how light and shadow work”. Which approach is better depends on what you want to do. “Draw what you see” is a great way to get a jump-start on drawing actual objects, and can be learned pretty quickly. However, it doesn’t set you up very well for drawing imaginary objects, because you are reproducing what you see without understanding why it looks like that. As a result, after starting with an empirical approach, I’m finding myself looking towards the more theoretical books because they have what I need to “roll my own” in designing imaginary objects. (The best books on theory I’ve found are Scott Robertson and Thomas Bertling’s How to Draw and How to Render. Similarly, I have been trying to abstract for myself some rules for good design, by observing successful (and not-so-successful) pieces and thinking about what does and doesn’t work. Another useful “rule” is that a piece should be as simple as it can be, but not simpler. Got five colors in a piece? Take one out and see if it still works. Got it down to four? See if you can do it with three. If it doesn’t work with three, you know four is what you need. The applications of these rules can be subtle but have profound implications. For example: good three-dimensional art with complex shape rarely has complex pattern. In particular, intricate shapes tend to be solid colors – think bronze or marble sculpture, complicated origami models, and so on. There is three-dimensional art with complex pattern, but it tends to have simple shapes: ceramic plates or teapots, for example. The more complex the shape, the simpler the visual patterning. Why is this? I think it’s because of the first rule I mentioned, that a piece should be about a single idea. In the simple shapes, the patterning dominates and is the primary “idea”. In complex shapes, the shape dominates and is the primary “idea”. If you throw complicated shape and complicated patterning into the same piece, you have two ideas clashing for dominance, and the result is visual confusion. Similarly, I think there’s a reason that the most really complex, demanding patterning is generally two-dimensional (painting, tapestry weaving, etc.). It’s because any element of shape is a distraction from the patterning, and flat two-dimensional is about as simple a shape as you can get. Paintings are (mostly) rectangular because an irregular shape, unless specifically needed for the “idea” of the painting, distracts from the patterning. The difficulty with abstracting rules is that for virtually every rule, there is a good design that breaks it. So books on design generally limit themselves to discussing the elements of design – rhythm, repetition, contrast, and so on – but don’t give you rules for how to put them together. Which I understand – and it’s a good idea not to, since people are apt to take textbooks as an unquestioned source of truth – but which leaves me flopping around trying to understand what makes a good design. I’d like to understand successful artists’ rules of thumb so I can decide whether they apply to my art and my tastes or not. It’s quite simple: concentric circles in three dimensions. But as simple as it is, it is still complicated enough that a really complex pattern is likely to clash. But if I did a concentric pattern of waves and water drops, that might support an “idea” of ripples on water. 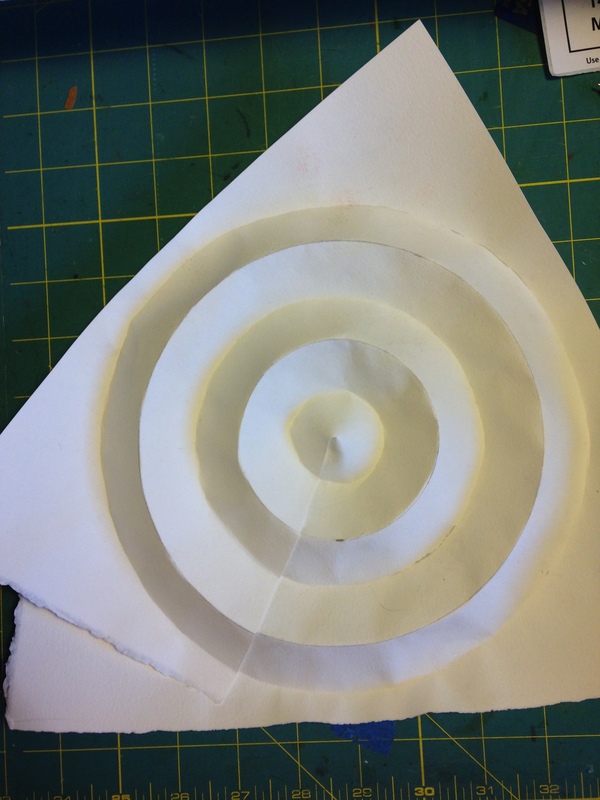 I could then modify the origami pattern to look more like irregular ripples, and less like a bullseye, to support that idea. But merging the shape and the pattern to support a single idea, with both pattern and shape necessary to support the idea, is definitely challenging. I find all this utterly fascinating – good art is well-designed, and design does generally follow rules. One of the things I’m trying to do is establish my own set of working rules, which requires considerably deeper thought than one would expect just by walking through a museum and looking at the pretty things. Yes!!! Exactly that. You don’t need talent; you need understanding and skill. And that’s good news, because the myth of talent says that only some people have it (and the rest of us should just give up) – but understanding and skill are things that *anyone* can build up, over time. I think that would be a great topic for a blog post, now that I think about it…maybe tomorrow!